I love getting covered in mud, trying new things and being at one with nature. 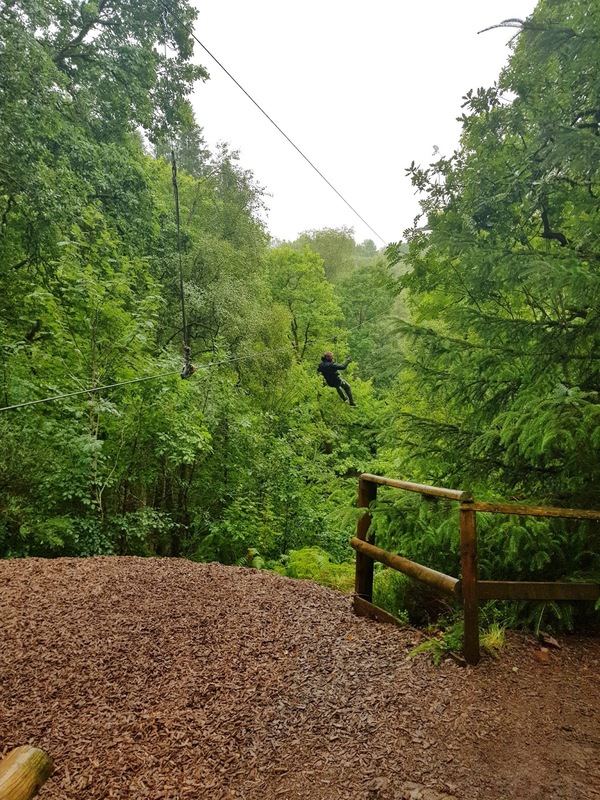 There's something very calming about it so when I was invited along to experience GoApe at Aberfoyle I was over the moon! I've heard about GoApe a lot, we actually tried to plan a trip to there before but people dropped out so we decided not to go. I was gutted because it looked like soooo much fun! 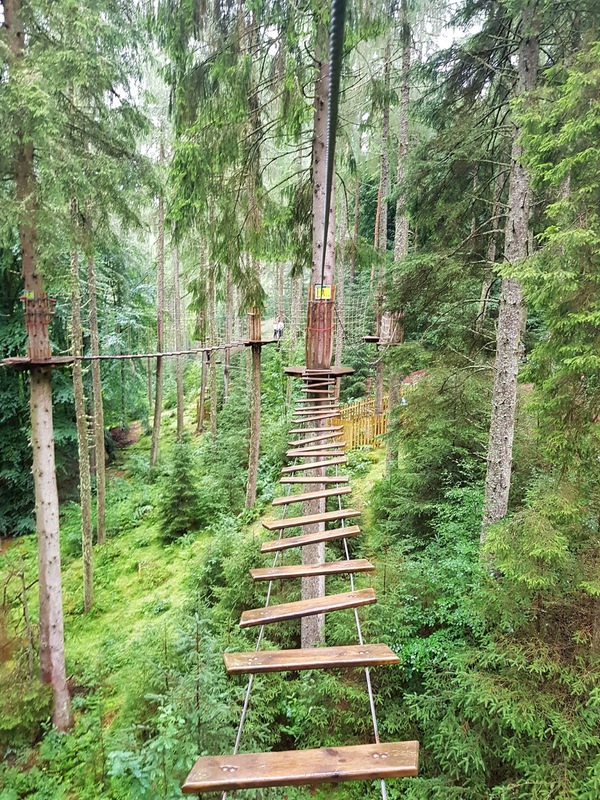 Climbing about, zip lining over the trees and getting the chance to be a kid again, get muddy and have a good laugh whilst fulfilling all those needs of an adrenaline junkie. 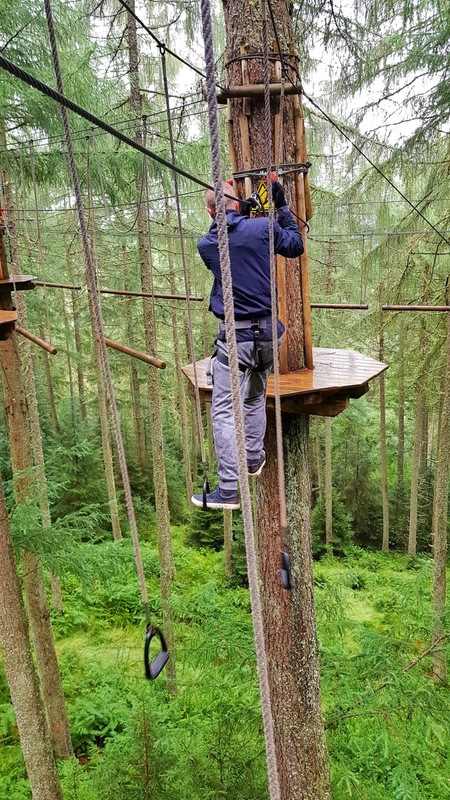 GoApe definitely allows you to do this, it's a big adventure course for adults (and over 10s) it's got a lot to offer but the best thing about it all, is trying something different and having a fabulous day out. 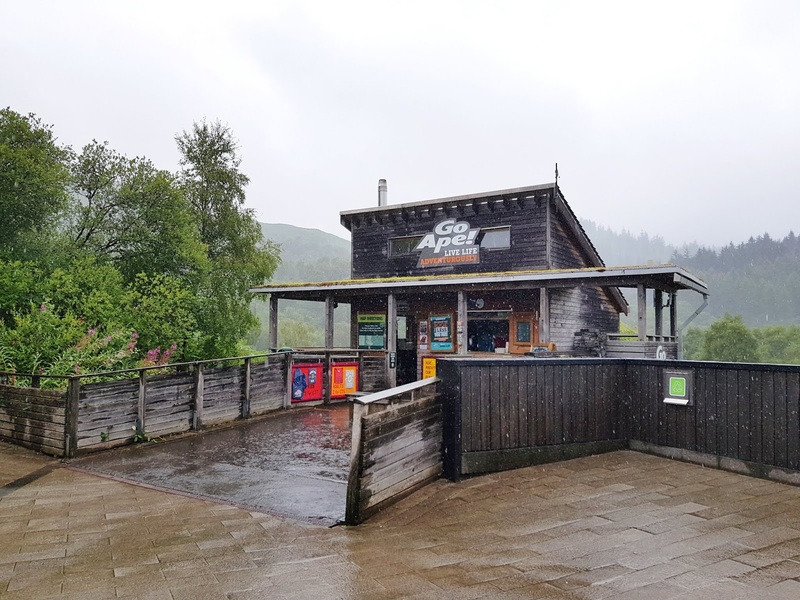 Stephen and I set off for Aberfoyle at half 10 in the morning on Sunday the 29th July, the rain was hitting the ground so hard that it was bouncing back up and we were FREEZING! I can honestly say I was dreading the whole experience a little until we were about 10 minutes away and the excitement hit me, WE WERE GOING TO GOAPE! Suddenly the fact that it was bucketing down with rain didn't bother us, both Stephen and myself were singing in the car, getting pumped up for the day ahead. We had our rain coats in the back seat, our change of clothes at the ready and our adrenaline pumping through our bodies, it was such an AMAZING feeling to say the least. As we have never been before, we were quite sure just how big the zip wires would be, we had no idea what to expect which I feel made it even more exciting. Once we got to GoApe we parked up and headed for the little "shed" building to get signed in for our experience, whilst there we decided to buy some gloves with grips on them because it was raining and my hands were freezing, with my fibro, if I'm cold my body starts to seize up so this was a good choice, it made the whole day a lot easier for me. We then had a walk around as we were a little early for our 12pm booking. We walked along some of the trails which was nice. At GoApe there isn't just the chance to swing amongst the trees, you can also go on nature walks and take in the sights, there's quite a lot to do as we found out from a nice couple who had been going walks with their dogs along the trails for years, they gave us some good recommendations on what we could do if we ever come back. Soon enough it was time to head up to the training area, this is where you get your harness on and go through the basic safety training because once you leave the first zip wire place, you are completely on your own and you have to navigate it all yourself (although there are the instructors dotted around the place who will be there if you need them but you are left to go through it all yourself) at this point Stephen and I were quite lucky as we got talking to some couples who were there and they were SUPER nice, we were all making jokes and it was really good to not feel nervous with the group we were with, everyone was very down to earth (apart from one couple, but lets not go there...) Although you are in a group with the safety talks and such you do go through it all at your own pace which Stephen and I done, at first we wanted to rush through to see who could get done the fastest but decided that we should take our time and savour it. Our instructor, Emily, was really nice, I couldn't get over how soft spoken she was and I was glad she was our instructor because she was very relatable. Once our training was done it was time to take on the first Zip Wire, looking at it my heart started to race and I was raring to go! 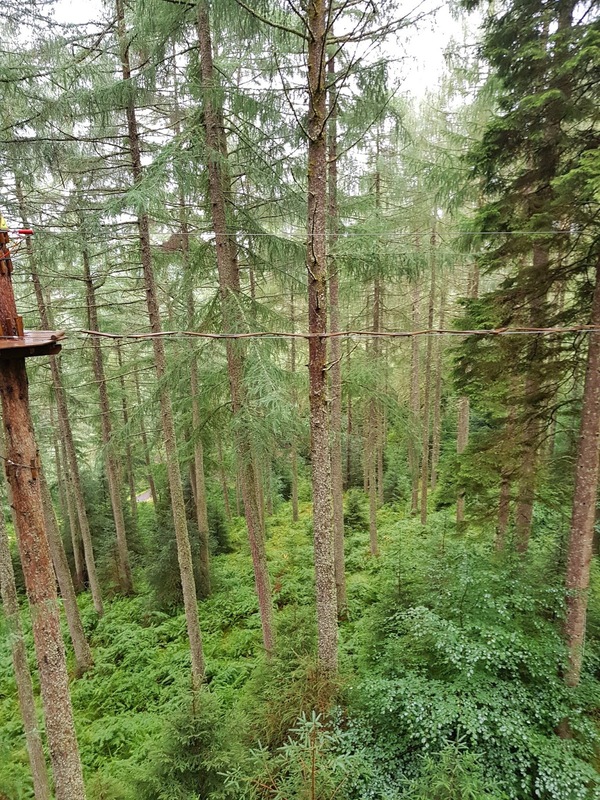 I was excited to swing through all the trees as the zip wire was LOOOONG. I went before Stephen so I could take pictures of him zipping along and I'm glad I did... my landing was hilarious, even the instructor laughed at me haha but I felt like I was in the air for ages, it kept going and that's not a bad thing, it was very enjoyable. Once Stephen was across we headed to the next area. We started climbing, making our way through the course and having mini panic attacks because it was very slippy due to the rain. We laughed most of the time, watching each other go through the trees, trying to navigate round the place and really bonding. I love how much we worked together throughout the whole experience, When my bones were sore and I felt like I couldn't go on any longer, Stephen was there to cheer me on and help me when I needed it. I think it's a great day out for couples, families, friends and more. You can book it for birthdays, just a fun day our or even a hen or stag party which would be a fun, different kind of activity. Now I'm thinking about Lisa's hen party.... haha. But seriously, it was so much fun and I seen that there was a big family group there of about 9 of them and all of them were laughing and making a good day out of it. It was nice to see that the rain didn't ruin it for anyone and all I seen was people smiling and having fun. 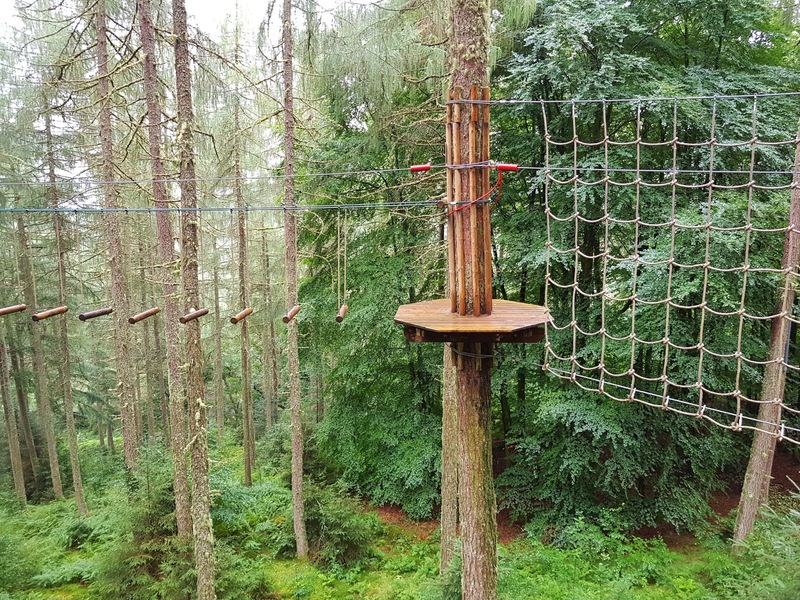 There's so much to do and many different places where you can experience a GoApe day like Cathes Castle, Glentress Forest, Dalby Forest and many more locations throughout the UK so you will be able to find one near you for sure and get to have a fabulous day out. There is an age limit though, you can't take children under 10 years old and on their website they have all the details on who is suitable to go and more, you can check that out HERE. I have to say, I was so incredibly impressed with the experience at GoApe as was Stephen, we laughed the whole day, we bonded and we pushed ourselves which was just so liberating. We loved it so much that we are planning on going for someones birthday in the next few months as we feel it really would be a different kind of birthday surprise but very entertaining. I really hope that if you're reading this that you try this out at least once, it's perfect for those adrenaline junkies of you out there who like to have new, exciting experiences. 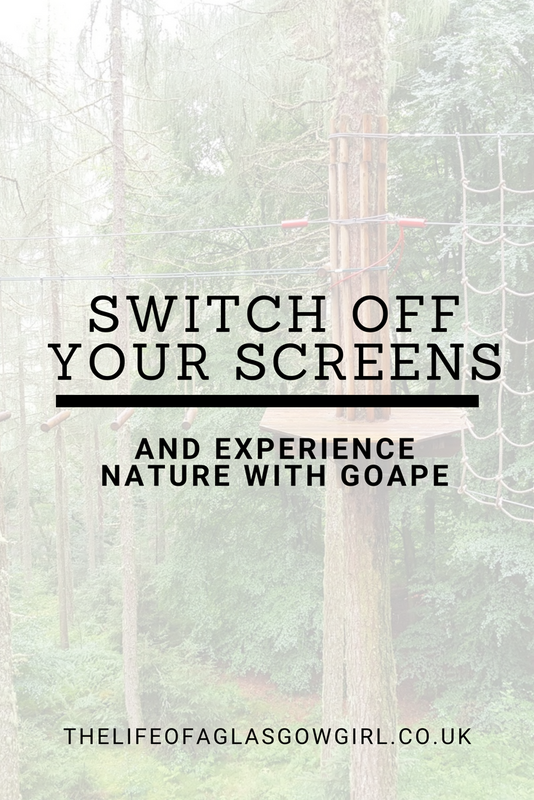 Now that you have read all about it, why not switch off your screen and go experience nature, at GoApe, it will be WORTH IT. Sounds fun! My son works for Go Ape and absoluely loves it. Aww that must be a fantastic job! I would love to work there, it's tons of fun. This sounds so fun!! I absolutely love being outdoors & unplugging from technology -- my family & I head to a cabin in the mountains every Veteran's Day Weekend & I love being without wifi, spending time with my family, and hiking away to my heart's content. I have yet to go zip-lining though, and while I'm nervous to do so, I know I'm gonna enjoy it!! It's a fab experience! It's so good to just get away from all things technology isn't it? Aww that sounds like a really great time, it must be fun having that to look forward to every veteran's weekend. It is really fun to do! I loved it, it's amazing just feeling so free. I love GoApe and have been to their Forest of Dean site twice. It's a lot of fun zipping through the air. Oooo nice! I really want to try and go to as many as possible around the UK to experience the different activities.